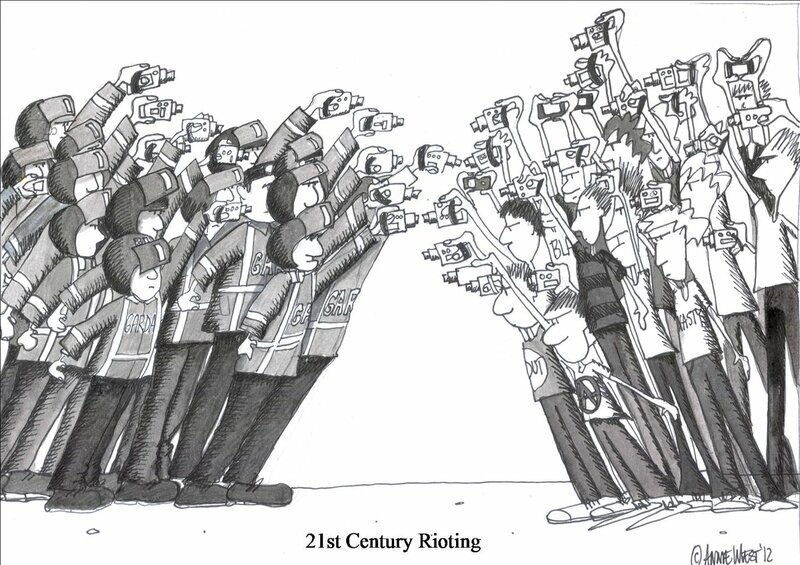 Cartoonist Annie West highlights an inescapable feature of modern civil disturbances. Yesterday, the verdict was in on the Jobstown 6 – unanimous acquittal for all 6, a decision reached in only 3 hours. The trial had lasted for 8 weeks. Now for any readers not familiar with the Irish water charges protests, I’ll explain before I go any further. On November 14th, 2014, the then Tainaiste, or deputy prime minister, Joan Burton was attending a graduation at a college in Jobstown, an area of Tallaght in Dublin. There had been ongoing protests about the hugely unpopular introduction of water charges and sure enough, Deputy Burton was greeted by a group of protestors who were shouting and who threw eggs and water bombs at her and her group. After the graduation, the protestors, around 100 or so, were still outside the college. The Tanaiste hurried to her car and the protesters surged around it, there was a standoff lasting several hours. The story even made the BBC news. Most people watching the news that evening or watching events unfold on social media would have expected there to be arrests. What few expected, was that the charges would include false imprisonment, an offence which could result in a life sentence – an unusually harsh charge for a protest in which no-one had been injured. Socialist TD Paul Murphy and South Dublin County counsellors Kieran Mahon and Michael Murphy were among those arrested. In October last year a 17-year-old boy, who had been just 15 at the time of the protest was convicted of false imprisonment but did not receive a custodial sentence. When the trial of Paul Murphy and six other men, including the two counsellors, started in April this year, interest was understandably high. Sitting TDs don’t often end up in court in Ireland. Giving evidence Joan Burton described how terrifying she found the whole event. The Minister for Children and Youth Affairs Katherine Zappone told the court that she was scared for the Tainaiste’s safety. Throughout the trial, Paul Murphy tweeted from court including commenting on evidence as it was given, under the hashtag #Jobstownnotguilty. In the end, it appears to be video footage from the garda helicopter, showing that the Taniaste’s car could have backed out of the situation at any point, that tipped the balance. Today, there has been the dissection. Should the case have taken place at all the press are asking, while Twitter appears to be fairly adamant that it shouldn’t. This has been a case that has divided the establishment, including most of the media, and the public, or at least, those of them that comment online. It isn’t just the armchair pundits up in arms though, former Minister for Justice and serving barrister, Michael McDowell said the false imprisonment charges had been a “sledgehammer to crack a nut”. My own view is that this could never have been anything but an intensely political trial. While I’m sure Joan Burton was genuinely scared, pursuing this case did seem a bit of a witchhunt. In terms of violent protests, Jobstown wasn’t really up there with a full-scale riot. 100 people isn’t thousands. Shouting crude insults and throwing eggs and water bombs is certainly not peaceful protest best practice but it’s a long, long way from throwing Molotov cocktails or bricks at police in riot gear. I remember watching the events on the news at the time and thinking, why didn’t they just reverse? The crowd were noisy and threatening but looked like a fairly typical angry Dublin crowd. There was a little whiff of Marie Antoinette about it. I genuinely don’t mean Joan Burton any harm. She taught me business and finance in college and was fine as a teacher. As a politician though I’ve had some doubts. As a Labour Minister for Social Protection, she smilingly cut the ribbon on a food bank. I’ve often thought she could be a little tone deaf on the public mood. The water protests, while they were about the introduction of water charges, ended up encompassing a lot of the anger that had been simmering in austerity-hit Ireland. In much the same way as Brexit was the straw that broke the camels back for a large chunk of Britain’s population, so water charges were the final straw for people who had been putting up with a lot since the economy crashed in 2010. Water protests became a way of protesting everything that was wrong with Ireland. Another disconnect is visible today in much of the coverage. While I don’t expect the Irish Times to be the most liberal of papers they’ve been drawing a lot of fire online for their coverage of the verdicts. Their editorial announced that “jury trials were under strain”, while elsewhere in the paper Colm Keena wrote that the case showed a damning vision of modern Ireland. The focus has been on the behaviour of the accused men rather than on the fact that this was arguably a case where the state had tried to clamp down on protestors. Ireland has long had issues with members of the public expressing a strong opinion as this 2013 article by Gavan Titley in the Guardian shows. The world has become a much angrier, more violent place since that article was written but we do well to remember how we got here. Of course, when I start looking back to the beginning of anything these days I tend to overshoot a little. This case has got me thinking about someone I’ve been researching for my PhD, Irish journalist and patriot Charles Gavan Duffy. Duffy was a founder editor of the Nation newspaper and a prominent Young Irelander who, after the failed rebellion of 1848 found himself on the wrong side of the law. Now Duffy and Paul Murphy don’t share much in the way of politics but it’s Duffy’s behaviour when he was on trial in December 1848 that puts me in mind of this case. Being a journalist, Duffy knew how the papers worked – and that allowed him to play things in his favour, just as Paul Murphy has done with his Twitter followers. The Freeman’s Journal of Thursday, December 7th, carried the rather extraordinary content not only of the actual indictment that had been served against Duffy, but also Duffy’s lengthy response to the Sherriff of Dublin. These would have come from Duffy, of course. In his letter to the Sherriff, Duffy lays down all his problems with the trial, before it was due to start. Freeman’s Journal, December 7th, 1848. Duffy argued that his treatment had been unfair. Image © THE BRITISH LIBRARY BOARD. ALL RIGHTS RESERVED. Duffy was convinced that he would not get a fair trial and gave numerous reasons to back up his opinion. Freeman’s Journal, December 7th, 1848. Duffy argued that a jury would be prejudiced. Image © THE BRITISH LIBRARY BOARD. ALL RIGHTS RESERVED. 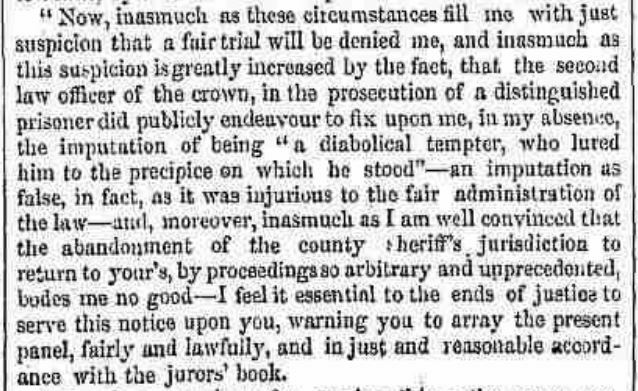 The Freeman’s Journal that day also contains letters from both Henry Grattan and Lord Cloncurry about jury packed against Catholics and Duffy also voices his concerns with reference to the previous trial of fellow Young Irelander John Mitchel. Freeman’s Journal, December 7th, 1848. Duffy voices his concerns about the stacking of the jury in John Mitchel’s trial. Duffy was eventually released after 5 trials. I’m not saying that the water protestors are the same as the Young Irelanders but I am left with a feeling, after reading the coverage today, perhaps certain parts of the Irish media and certain corners of the government should take a look at their history books and find out how show trials went down in the past. The 1848 rebellion might have been a failure but it was looking for an Ireland that ruled itself. One could argue that the water protesters were also trying to take their country back, in a way. It’s more complicated than that and I’m not going to go into the ins and outs of the water protests and the problems of modern Ireland in any more detail but the echoes are there – and they leave a discordant note. Trials like these are always political. Duffy’s trial hung on the threat to the state and Murphy’s also. In the Jobstown instance the threat was explicit and the opportunity was taken by the state to intimidate those who weren’t yet committed to protest. Joan Burton was expressly asked not to attend the award ceremony by those taking part but instead chose to go knowing a protest was likely. In effect a preemptive move to test the water. The response was disproportionate as the false imprisonment charge was ridiculous when a lesser charge of assault /riotous assembly would have sufficed. This is an equivalent to the expected 19th Century draconian response – except that in Ireland in 1848 the response was relatively measured in comparison.. Trials, due process, and transportation were more ‘just’ than, for example, the executions environment en masse in Vienna in October of that year. In some way the response to “mob rule” and disorder has become less enlightened in the Ireland of today. You could argue that the authoritarian catholicism of modern Ireland is a retrograde version of the Anglo-Catholicism of earlier times. Riot was seen in the 19th century as a safety valve where as now it’s seen as a more substantial threat to the status quo. Insecurity of tenure can give rise to overreaction so while I’m not surprised at present day attitudes I’m constantly surprised at the behaviors of what we’re led to believe were less enlightened times. This is a rare example of living activist history is Ireland today. We need more of it.